Our comprehensive line of high-quality GSR field sampling kits includes certified SEM pin stubs with double-coated adhesive carbon tabs in plastic tubes. The certified SEM pin stubs have very low amounts of Pb, Sb and Ba, not detectable by SEM/EDX. The caps securely hold the GSR sample disc for easy GSR collection. Pre-labeled discs and tubes are both ready-for-sampling. 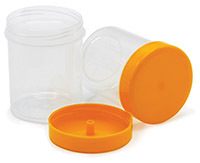 A sturdy, sealed tamper evident transport box is also included. Numbered, certified aluminum mount with a double-coated adhesive carbon tab applied to secure the sample in a clean, glass vial 25 mm OD x 55 mm High (1" x 2.17"). Packaged in a box of 100. Numbers can be specified as 100 consecutive numbers between 0 and 9999 (greatest number). Please inform customer service about the numbering sequence when ordering this product. Includes ten 12.7mm SEM pin mounts in clean, glass storage tubes (25mm OD x 55mm high) secured in a compact transport box with labels. 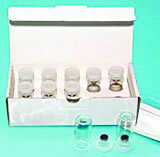 This Kit is designed to avoid any contamination of GSR samples. Choose from either standard 12.7mm pin mounts with 8mm pins or with shorter 6mm pins. Also available as a sample kit without mounts and tabs. Glass specimen vial (25 mm OD x 55 mm High) with a high-purity certified 12.7mm SEM pin stub specimen mount (see below), both with and without an adhesive carbon conductive tab, mounted into the plastic cap. Our Forensic Field Sampler has been designed to collect forensic evidence with minimum interference and/or contamination from the sampler. Three versions are available: without adhesive carbon tab, with ready-to-use adhesive carbon tab, or with covered carbon tab (plastic cover needs to be removed prior to use). Choice of standard 12.7 mm SEM pin mount with 8 mm pin or 12.7 mm SEM pin mount with shorter 6 mm pin (ZEISS/LEO). Ideal for SEM specimen preparation on the most frequently used SEM pin stubs, facilitating easy carbon coating for SEM/EDX investigation. 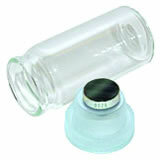 The Forensic Field Sampler can be securely stored in the glass specimen vial and easily shipped with the cap holding the sampler stub in place. Adhesive carbon tabs secure the evidence material. This mount is made from a special certified Aluminum alloy which does not contain any of the objectionable elements that may interfere with samples collected for GSR. These mounts are available with an 8mm or 6mm pin. A plastic tube and plug. The pin mount ⅛" (3.1mm) in diameter is inserted securely to the plug and protected by the tube. Ideal for storage or mailing. A plastic tube and plug for M4 threaded Hitachi mounts. 15mm in diameter Tube. A 15mm Hitachi mount can be inserted securely to the plug and then protected by the tube. Ideal for storage as well as mailing. The internal diameter of the tube is 0.83" (21mm). 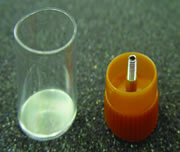 The Outer measurements of the tube are: 0.9" (23mm) x 2.05"H (52mm). A plastic tube and plug, used for large specimens. The pin mount ⅛" (3.1mm) in diameter is inserted securely to the plug and protected by the tube. Pin mounts can be up to 38mm diameter. Ideal for storage or mailing. Measurements are as follows: Internal Diameter of the tube is 1.53" (39mm). The outer measurements of the tube is 1.57" (40mm) x 2.95" (75mm). Max height of sample on stub is 1.18" (30mm). A plastic tube and plug for M4 threaded Hitachi mounts. 38mm in diameter tube. A 38mm Hitachi mount can be inserted securely to the plug and then protected by the tube. Ideal for storage as well as mailing. The internal diameter of the tube is 1.53" (39mm). The Outer measurements of the tube are: 1.57" (40mm) x 2.95"H (75mm). Max height of sample on stub is 0.98" (25mm). 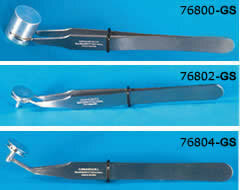 Dumont Gunshot Residue Tweezers, the finest tweezers available. Choose the one that best suits your needs. 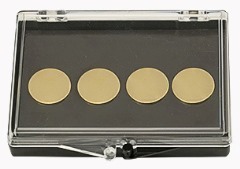 GOLD SEAL® cover glass is made from pre-selected, pre-cleaned silicate glass. It is packaged with desiccants in a lint free box. Both cover glass cases and slide boxes convert to convenient slide storage files. The highest quality mica (V-1 or V-2) for AFM applications to the Medium Quality (V-4 to V-6) for replication and thin film deposition. EMS Mica Sheets offer a clean surface for EM applications, carbon filming and particle spraying, as well as for AFM applications. There are two types of mica: muscovite and phlogopite. Generally, one differs from the other by color (Muscovite is Ruby, Green or White; Phlogopite is Amber, Yellow, or Silver). The maximum operating temperature for Muscovite is about 500-600°C and for Phlogopite is about 800-900°C. Our line consists of High Quality Muscovite Mica. This mica peels off very thin up to 0.0001" uniform layers, exposing "virgin" mica upon splitting. Muscovite, potash type mica, sometimes known as granitic mica, is the best of all micas in dielectric strength, perfection of cleavage, and transparency. It has the following chemical formula: H2KAI3(Si04)3. It has a vitreous luster and is colorless to gray, brown, pale green, violet, dark olive green, or rose red. It may be transparent to translucent. It has strong double refraction and is optically negative. It loses water of constitution at 600°C and is practically non-magnetic. It exhibits pleochrism, which is the property of varying in color when viewed from different angles. RUBY muscovite is harder than green and has a pale brownish red color in thin sheets (0.020") or ruby red in thick plates (0.4"). Ruby mica can be split easily into films of 0.001" or thinner because it has such excellent cleavage. In other colors, this thinness can be obtained but at a considerable risk of cracking. The quality of muscovite mica is verbal determination by visual quality classification ASTM (D351-57T) from the best V-1 to the worst is V-10A. 1. V-1: Clear - Hard, of uniform color, nearly flat, free of all stains, foreign inclusion, cracks, and other similar defects. 2. V-2: Clear and Slightly Stained - Hard, of uniform color, nearly flat and may contain slight crystallographic discoloration, and very slight air inclusions and not more than one fourth of the usable area. 3. V-3: Fair Stained - Hard, of uniform color, may contain slight waves, slight crystallographic discoloration, and sligh air inclusions and not more than one-half of the usable area. 4. V-4: Good Stained - Hard, of uniform color, may contain medium waves slight crystallographic discoloration, and medium air inclusion in not more than two-third of the usable area. In general, for those whom are using mica for the making of carbon support films, thin films coatings research, and some AFM studies where HOPG are used to taking place, the mica V-4 or V-5 is recommended. (Mica must always use freshly cleaved surfaces). For AFM and SPM calibration, V-1 or V-2 is recommended. However, we believe that it is important that you know what kind of mica is being used in your lab. The information on the mica as given above should be used to make your choice. Here at EMS, we try to stock a variety of sizes with different thicknesses and classifications of quality for convenience. Standard Carbon Conductive Adhesive Tabs – Tabs are formed by two sides of thick conductive adhesive (45µm on each side) with the center conductive core film (35µm). With the total thickness of 125µm, these tabs will offer reasonably firm, smooth surfaces for a variety SEM applications, including gunshot residue analysis. Tabs are protected by white liners, which do not have to be removed when samples are ready to be mounted. Tabs contain some traces of Si, Sb, S, Fe, Mg, Na. Thick Carbon Conductive Tabs or Image Tabs – The stiff and smooth surface conductive tabs are 260µm thick, including 200µm thick conductive carbonate base, coated 30µm thick on each side with conductive adhesive. However, these tabs are not as conductive and sticky as the Standard Carbon Conductive Tabs. Thick Carbon Conductive Tabs are used for photographic background as well as for Jet Scan applications, where the tabs must be removed and filed away. Ultra-Thin Carbon Conductive Adhesive Tabs – These tabs have Core material which is nonconductive cloth (70µm) with Carbon Filler Conductive Adhesive (2 x 45µm). Total thickness is 160µm. 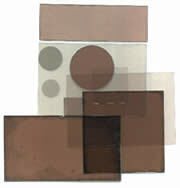 Spectro Grade Carbon Adhesive Tabs – High purity conductive carbons for less interference signals, such as X-Ray analysis. Ultra-Smooth Carbon Adhesive Tabs – Carbon adhesive tabs that eliminate issues with rough surfaces, insufficient tackiness, and hardness with significantly lower contaminant levels under EDS. Tabs are made in USA and very popular, and may be used in place of other conductive adhesive in many applications in conventional and field emission microscopes. 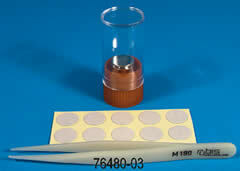 They are also widely used in forensic laboratories for study of gunshots residues. Without the addition of conductive coating, small nonconductive particles can often be imaged and X-Ray analyzed, cutting down your analysis time. These tabs are composed of a thin film of strong adhesive approximately ½" diameter. Over 99% transparent to EDS, with a very small amount of nickel (0.6%) and copper (< 0.3%). Refrigeration will increase shelf life but tabs need to be warmed up to room temperature before use (usually more than one hour).